Peonies are among the elite of ornamentals. When well provided for they give increasing rewards for years and will continue to do so indefinitely. Peonies that were planted long ago are often seen flowering around older homes. They also may be seen at abandoned rural house sites and old cemeteries where they continue to flower regularly with no current care. When suitably positioned, peonies planted today will give similar results. 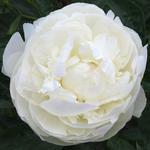 In order to perform well, peonies must grow well and attain mature size. New plants may require two or more seasons to reach the state of growth necessary for them to give typical flowering, depending upon the growing conditions they are given, and upon the natural habit of the individual variety. While they will tolerate poorer soils, provided their other needs are met, it may take several seasons to see a flower. What it means for a peony to grow well is that during each growing season the plant stores as much food as possible, producing big storage roots. This enables the annual increase of stems and flowers until the plant reaches equilibrium with its environment. While the same things can be said of many garden perennials, what is special about peonies is that they produce relatively very large plants during a short period of rapid growth. As with spring bulbs, this growth comes mostly from stored food. Peonies grow best in a fertile, well-aerated and well-drained soil; such as will grow a good vegetable garden. Since they are long-lived perennials, any modification of the soil in their root zone must be done before they are planted. That is where the idea of a "hundred dollar hole" for a "ten dollar plant" gets its merit. Whole bed modification may be needed. A prevalent problem occurring from land grading in new residential development is topsoil loss. Any substantial correction should be made as part of the initial site development. Although peonies may tolerate low fertility, they develop accordingly slower in poor soils. Peonies growing under such conditions will benefit from periodic top-dressing, possibly needing sources of both the major nutrients and the minor nutrients (trace elements). Depending upon the availability of suitable materials, either organic sources and/or more refined products may be used. Periodic addition of compost is normally very helpful. 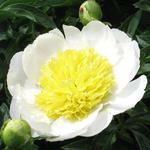 Peonies also tolerate dryness, but don't expect them to be producing and storing food while the soil is dry. Further, prolonged moisture stress (as with heat and drought) can be expected to bring on early die-off of the foliage and the end of food storage for the season. If this does not occur until the last half of summer, the effect on long-term performance may be minimal, but the foliage deterioration will be unsightly for the remainder of the season. In chronic moisture-stress climates, sites protected from direct sunlight during the "heat" of the day and sheltered from hot, dry winds will offset some of the adverse effects of low soil moisture, while judicious irrigation can give plants the moisture they need to function. Avoid watering around the base of stems; the water is best applied beyond the perimeter of the leaf canopy, as in a shallow moat meant to moisten the outer half of the root zone. Summer mulch may help. Peonies may benefit from treatment for leaf and stem fungi, diseases that become more pressing under conditions of prolonged high humidity. While the plants are generally tolerant of partial leaf loss to summer leaf diseases, early spring infestations that occur during cool, humid periods may be more devastating, sometimes leading to stem death and crown rot. Under such conditions, the plants may benefit from a timely application of suitable fungicides. However, the first level of disease management is prevention. Select sites having good air circulation, especially during early spring. Sanitization is next; ensure to clean up and dispose of old foliage and dead stems in the autumn to reduce carry-over from one season to me next. Peonies will not tolerate poor aeration of the root zone. In order for the plant to extract what it requires from the soil it expends energy, which is released through respiration, requiring oxygen. Any time the soil pores (the voids between the soil particles) are loaded with water, the air is excluded. 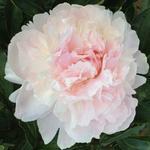 Peonies do best with a deep root run, 18-24 inches deep, or more, depending on habit of the individual variety. There needs to be someplace below this root zone to where excess water can percolate away. The excess needs to drain away within hours after cessation of rain or irrigation. For an unknown site, you can determine the drainage characteristics by a percolation test, as might be used to evaluate a site for a septic tank absorption field. Dig a hole at least 18 inches deep, fill it with water enough times that the surrounding soil is well wetted. Then refill it and time how long it takes for the water to get away. A half hour or less suggests an excessively droughty site. Two to four hours may work very well with an ordinary calendar of rainfall. However, if water remains in the hole much longer, you have a chronic wet situation. 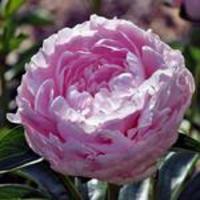 Install mechanical drains to change the situation or select another site for your peonies. Raised bed strategies will be of help, but still must be designed so that the drainage water gets away deeply. Remember, excess rainfall is often seasonal. A site which may look just fine in the relative dryness of autumn may be wet next spring when the plants are making their most important growth, thus the value of a percolation test. Some peonies are more sensitive to poor aeration of the soil than others. The so-called tree peonies (woody stems) and many of the natural species, which are mountain plants, may do best in a coarser soil having good drainage, provided they can be adequately protected from moisture stress, as discussed earlier, especially important in hot locations. On balance, a deep, well-drained loam is an effective compromise. Shade and shielding from hot summer winds will be beneficial. Judicious irrigation during dry times is valuable for all types of peonies; so long their leaves remain green. For the tree peonies, soil moisture throughout their growing season is essential, if they are to obtain their best performance.